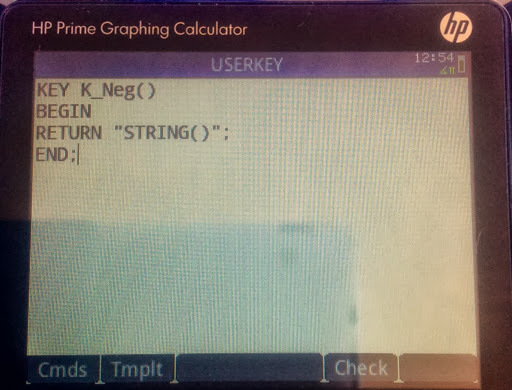 On of the features of the new HP Prime is the ability to assign custom programs, mathematical commands, or constants to the keyboard. Change Sign [ +/- ] key. 1. Create a new program and give it any name you want. 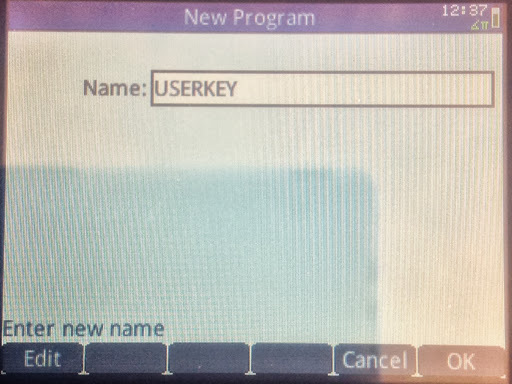 For this example, I name the program USERKEY. USERKEY is going to be where I store my user key assignments. 2. Clear the program editor. There should be no EXPORT-BEGIN-END structures on the screen. 3. Press the [Menu] key. 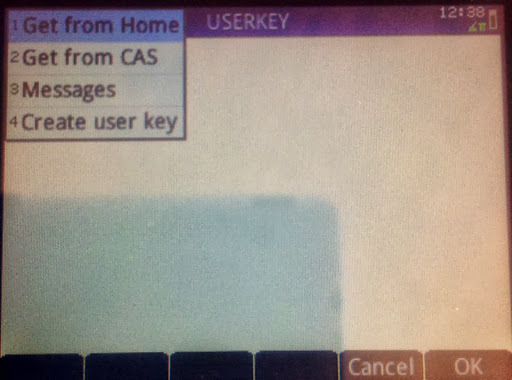 The [Menu] key is on the upper right hand corner section of the keys, to the left of the [CAS] key and below the [View] key. 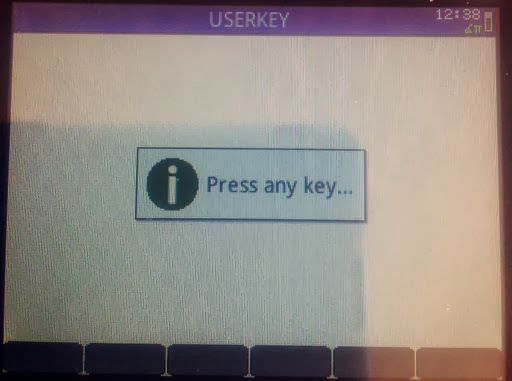 Select option 4: "Create User Key". 4. At the "Press any key..." prompt, select the key for which you want to assign your command to. For my illustration, I will press the [+/-] key. 5. 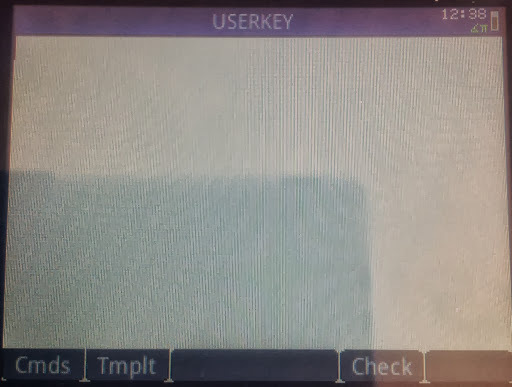 The user key template will appear of the programming editing screen. In between the BEGIN and END; is where you will type. Note that the appropriate key code will be entered for you. 6. Call the RETURN command by pressing the soft key (Tmplt) then selecting "Block" then "RETURN". Type your command and program in quotes. You can also call them from the various HP Prime menus or the Catalog. It is very important that you end this line with a semicolon (;), otherwise a syntax error occurs. Note that user key assignments and edits are saved automatically. There is no need to run the USERKEY program. Illustrated below is me putting the STRING() command. This assigns the STRING command to the [ +/- ] key. For additional key assignments, repeat steps 3-6. Each key assignment template stands alone. Do not nest key assignment templates. To use a user-assigned key, first press [Shift] + [Help] (User). An orange "1U" indicator appears on the top left hand corner of the screen. 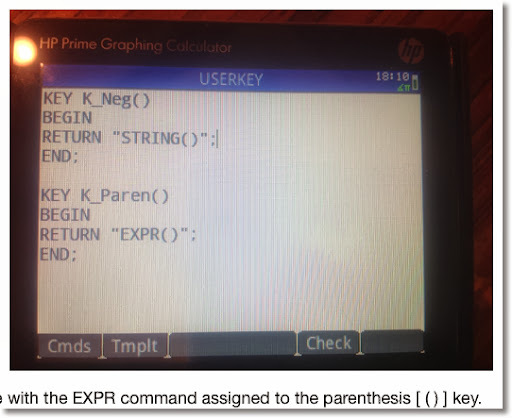 This means the next key pressed will execute the user-assigned function (if there is one). For my example, pressing [Shift] + [Help] (User), [+/-] brings up the STRING command. Be sure to take notes of your key assignments. Look for additional HP Prime programming tutorials in the upcoming months. The morning started off with a Q&A panel. The speakers were Ruth Patterson, Jason Smith, Cyrille de Brebisson, and Tim Wessman of the HC Calculator Group. 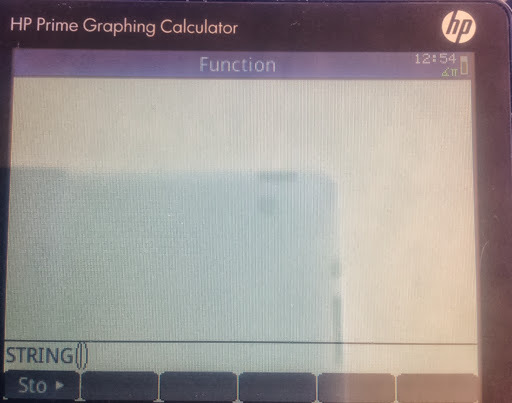 * The education market was a primary topic of the session, and how HP calculators, such as the Prime and 39gii, along with connectivity software play a role in education. * The contrast of the keys and keyboard were discussed and how important it is to the user in terms of readability and usability. 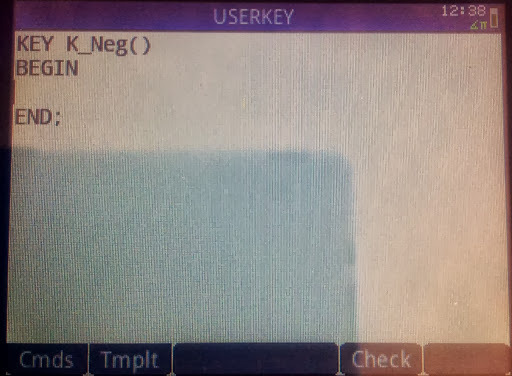 Note that most HP calculators the color of the type on the keys are black or white for the primary functions, and blue and orange for the shifted functions. * There was a discussion of how the calculators can be used in both educational and professional settings. 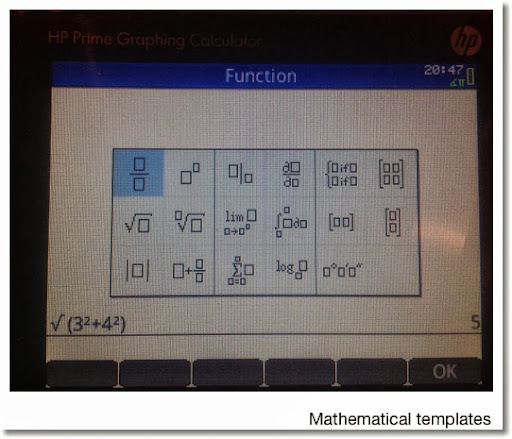 * The HP Prime was named as such because the team wanted a mathematical term for a name, and to differentiate it from prior calculators which had numerical names. At the end of the session the HHC committee presented two plaques: one to Cyrille de Brebisson for 15 years of being part of the calculator community and innovation, and one to Tim Wessman for 10 years. David Ramsey talked about the HP 85 computer, and it is a beauty. Manufactured in 1980, the 85 had 16K of RAM that could be expanded to 64K. Only catch was up to 32K could be used for programming. It is a stand alone machine complete with printer. The screen is a 256 x 192 monochrome screen. 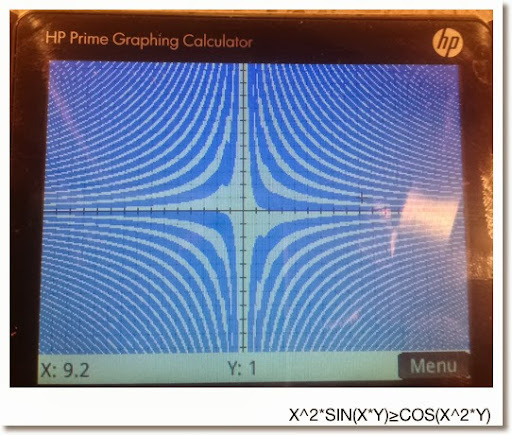 Plotting is limited on the HP 85; the pen could draw the axis, tick marks, lines, and points. However graphic buffers can be saved and restored. Processing can slow due to the limited amount of pins in the processor. The tape drive originally ran on DIC 100 cassettes, which had a limited life. Ramsey had his HP 85 modified so that QIC tapes are used. The back of the 85 had four ports, which a port can hold a drawer holding up to 6 ROM cartridges. Dan McDonald (I hope I get his name right, apologies if I don't) stated he like calculators because they are like puzzles and use allowed the our brains to be exercised. Namir Shammas commented that calculators are accessible devices. I agree with both gentlemen. * A four-volume set of notes from previous PPC conferences, calculator journals, conference proceedings from Australian conferences, notes from all of the previous HHC conferences, and HP 41 programs, 1,343 programs consisting of 5,844 pages, complete with bar codes and dot data files. We thank both Jake and Jackie for hours and hours and hours of hard work, typing, and dedication to this project. * A DVD of 1970s calculator ads. Charles McCord (again, apologizes if I have the name wrong) spoke about his life working at Hewlett Packard. 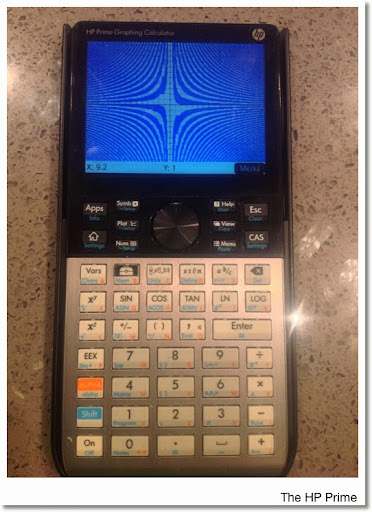 He was inspired to save money over the last two years of high school and some of the first year in college to purchase a HP 65 after his father bought a HP 45, and how to understand how calculators work. When working for HP in Corvallis, McCord started as a quality engineer working with the HP 41. He lead a team develop a modem for the HP 75, which gave it additional memory and power, at the request of AT&T. He was also a manager for the single chips produced for the HP 10 series. McCord also lead a group of engineers to develop printers and mini-computers in Vancouver and San Diego. * One of his supervisors was humorously given an HP 41C glued to a car battery since heavy ROM use easily ate up the battery. * The first modem cases for the HP 75 were fine except the computers were resetting. Turns out the case pressed the keys for a soft reset. Plastic shields that were added to the case took care of the problem. * In a test group for the original HP 12C, one of the NAND gates were locked, causing a row of commas to fill the screen each time the ON and decimal point keys were simultaneously pressed. Those calculators were not sold. * People returned their otherwise working HP 12Cs after several years of use because the batteries lasted so long, they did not realize that the batteries died. McCord now works for Aptima. A final panel assembled by Joe Horn, Cyrille de Brebisson, Jeremy Smith, Goeff Quickfall, Wlodek Mier-Jędrzejowicz, and Jim Donnelly takes about the adventures and misadventures of publishing. Best Speaker, as voted by the attendees, went to Geoff Quickfall. Congratulations to all the winners. 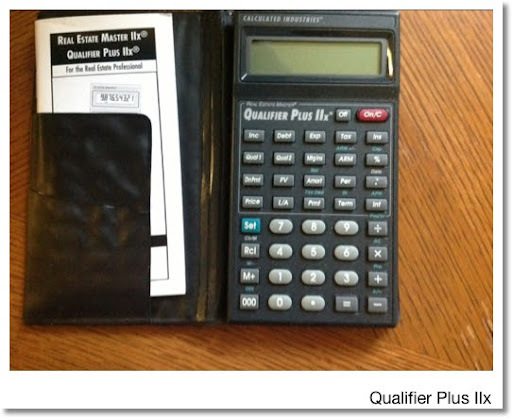 I believe you can find details of the RPN and RPL contests on the HHC 2013 page and the HP Museum of Calculator Forum. An HP 38G (1995). This is the beginning of the 38G/39G/40G/Prime family. Thanks to whoever donated the calculator. For the record, I took two slide rules and printed two dairies of HP calculator programs that I wrote for various calculators. * HP 25 with its charger and pouch. A good iOS emulator is the GO-25. * HP 48GX with a black LCD screen. 48GX calculators with black LCD screens are rare because they were the last 48GX to be produced. Most 48GX (and 48s in general) have blue LCD screens. I am not sure if the names of the winners are posted on the HHC 2013 web site. Tim Wessman took a group of us on a tour of the office, where testing of calculators and connectivity software takes place. I had to leave to get to my hotel to connect for my ride to the airport. I probably have missed out on closing remarks and the after-conference party. I have to be back to work the following Monday. Once again, my heartfelt gratitude to all the attendees and the committee, a lot who have become friends, and to Hewlett Packard. You are a big reason why math and calculators are lifelong loves for me. Another conference has come and gone. Had a blast as always. Time flies when we are having fun. And I will talk to you next time! First of all, thanks to Hewlett Packard and everyone at the HHC 2013 committee (http://hhuc.us/2013/committee.htm) - you are all amazing! The HP Prime Has Arrived! 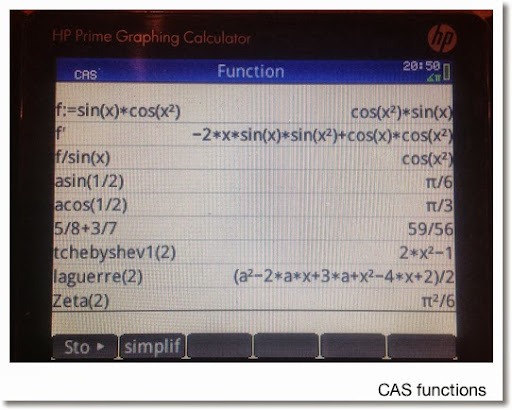 * Super advanced functions including the special functions Gamma, Beta, Zeta, Si, Ci, Psi, and Error. * Polynomials functions include Hermite, Lagrange, Laguerre, Legendre, Chebyshev, Cyclomotic, and Groebner. * The programming language is similar to the programming of the HP 39gii and 39gs. * Rechargeable battery with indicator. * 240 x 320 full color pixel screen. * App structure similar to the HP 38G/39G family. (And 40G for those living outside the United States). * The connectivity kit is dynamic, you can update the calculator and the emulator in real time. * Intelligent, multi-use programming commands. * Battery life lasts a good long time, I am told up to 23 days under normal use. Of course, use varies is dependent on how intense the calculation is used. Where can I get one? 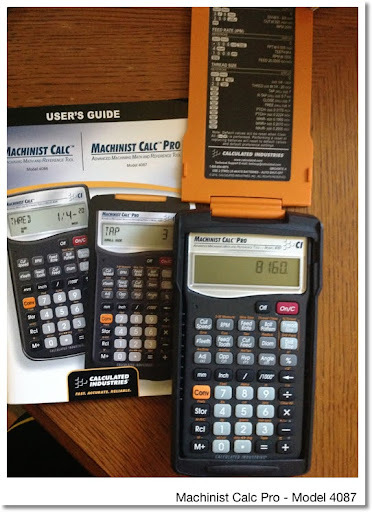 So far hpcalc.org, Bach Company, Samson Cables, and yes, even eBay has calculators for sale. Availability varies. How much does the Prime cost? Approximately $130 to $150 (U.S. dollars). I am looking to work with several of my friends and HP calculator enthusiasts on a Wiki page. Details are coming soon. And of course, I will be talking a lot more about Prime on this blog as well. We spent three hours without blinking talking about Prime this morning with Tim Wessman and Cyrille de Brebisson. Once again, thanks to all the speakers. It is one of my goals to actually have a presentation next year. Jim is the author of the several books on HP Calculators, including the "HP 48 Handbook". His contributions include adding drawing peripherals to classic HP calculators, the HP-71B Data Acquisition Pac, the Periodic Table for the HP 48G Series, and gave the legendary HP-01 calculator watch a new tool: a battery door opener. Jim also engraves designs and lettering onto aluminum plates, which includes a cryptic engraving "6accdae13eff7i3l9n4o4qrr4s8t12vx". It has something to do with calculus. Jim Johnson, from. Indianapolis, restored a HP-29C from a dead calculator to a full working one. He detailed how he took the calculator apart, cleaned the keyboards, gave it new batteries, and diagramed the electronics of the calculator. Tip: Do not plug a Woodstock calculator (HP 21 to HP 29, 1970s) unless it had a good battery. Otherwise, the battery may get fried. Eric Smith, who is on a mission to build a working RPN (Reverse Polish Notation) calculator from scratch. After several years of research he is able to pass around two working demos: one that emulates the HP-41 and one that emulates HP-42 (the latter by popular demand). Everything is open source. Smith is now working on how to get the SD card inserted into calculator and fully working. During his talk a poll was taken and the majority of attendees preferred AA batteries over AAA and button sized batteries. Jeremy Smith brought new life to road dots. A road dot the small circular numb that lines the lanes on our streets. He had designed several spherical pieces using road dots. He has also constructed a folding block of sixteen half-cubes connected by a string and a folding chess board. Wlodek Mier-Jędrzejowicz received an appreciation award for thirty years of contributions to the Hewlett Packard calculator community. Congratulations and well deserved! Gene Wright brought his collection of HP OmniBooks, which were manufactured in the 1990s, for show and tell. OmniBooks started as small notebooks (EX: 300) and by the end of their production run, they were full laptops (EX: EX3). Wright's collection focused on the earlier models. * HP Calculator Application: Runs like the HP 19B except with a full keyboard. * The mouse lived inside the notebook, came out with a press of a button. Wright's collection includes the OmniBook 600C and OmniBook 530, with a broken screen. * HP01 for active its timer feature so the crew can tell its passengers when they will arrive at their destination. Also the dynamic time features allows him to calculate how much fuel is used. * HP 71B for matching and verifying latitudes at certain points of the flight. * HP 41C with memory module to estimate the distance between airports. Quickfall also programmed the longitude and latitude coordinates of airports he flies to. The 41C is also used to print and organize break schedules for the flight crew. * HP 42S for to calculate the fuel left in the tank (by weight), and to see if the fuel levels passes standards. IMHO, I am a little jealous - I wish I could use one advanced calculator at my job on a regular basis. But accounting does not use mathematics beyond arithmetic 99.9% of the time. The day closed with Wlodek Mier-Jederzejowick showing us his latest edition of "A Guide to HP Handheld Calculators and Computers". There you have it - the highlights. I will report on Day 2, hopefully tomorrow. 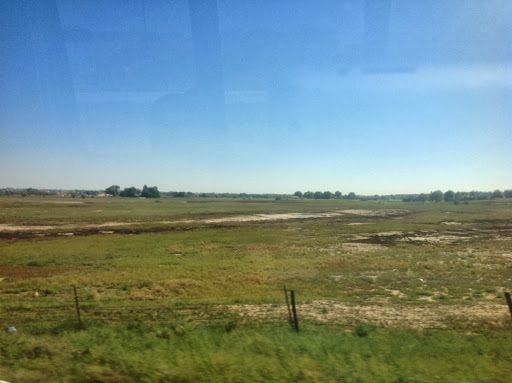 Greetings from Fort Collins, CO! I am here at Fort Collins, CO attending the annual HHC (HP Handheld Conference 2013). Basically, this is what ComicCon would be for calculator enthusiasts, particularly calculators made by Hewlett Packard. This is my sixth conference I had attended over the last decade. HHC is a two day conference taking place over the weekend. We usually fly/drive to our destination on Friday - meet and have dinner. There are some attendees who go on torus and field trips. Saturday is our intense day - we literally start from sunrise to at least 9:00 at night. Sunday is more relaxed, and that is where we have contests and door prize drawings. The web site of the conference is: http://hhuc.us/2013/index.htm, which takes place this weekend. HHC takes place during September. Over the weekend, if I am able to, I will relay some of the highlights. Until then, have a great day! The company Calculated Industries (http://www.calculated.com/) manufactures specialized calculators. I bought this calculator today at a pawn shop in Pomona. It came with the box, instructions, and the calculator in an Armadillo Gear case. I never seen a calculator being in such an industrial case before. This calculator is specialized in machinery calculations with a built in tables of drill points, drill sizes, and thread sizes. Trigonometric functions are featured (Adj, Opp, Hyp, Angle for right triangles and Sine, Cosine, Tangent for general trigonometry). The manual is a good size book and as of today I have yet to go through it and do the examples. This calculator specializes in real estate calculations, which include finding qualified amounts, time value of money, and PITI (principal, interest, taxes, & interest). I picked up this calculator at another pawn shop in Pomona, which is sadly no longer there. The next three calculators deal with construction. I think I got all three of construction calculators from Home Depot throughout last year. First is the simple calculator. The calculator had built in tables for concrete, carpet, and tile sizes (and more). 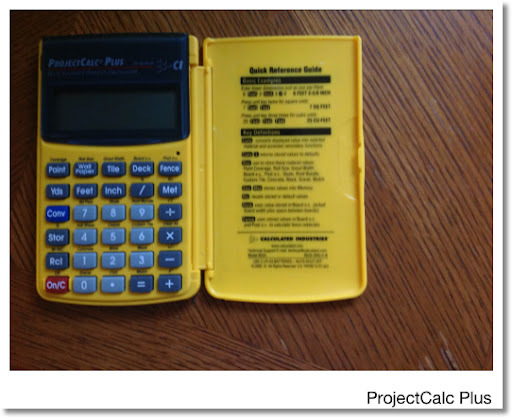 To me, the Material Estimator is the big cousin of the ProjectCalc Plus. 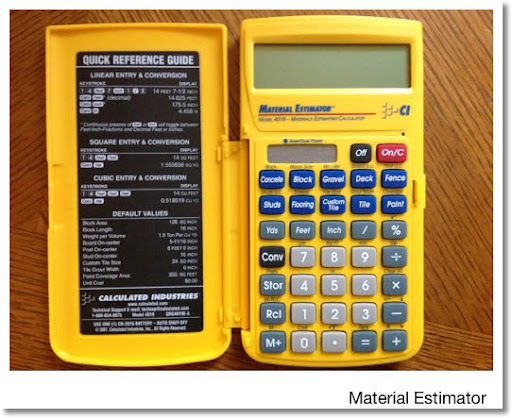 The Material Estimator has all the features plus an electric tape to keep track of calculations, a hard cover that stores the manual (which is really neat), and it is solar and battery powered. The Construction Master takes a different specialty than the ProjectCalc and Material Estimator. The Construction Master focuses on stairs, roofs, risers, and walls. 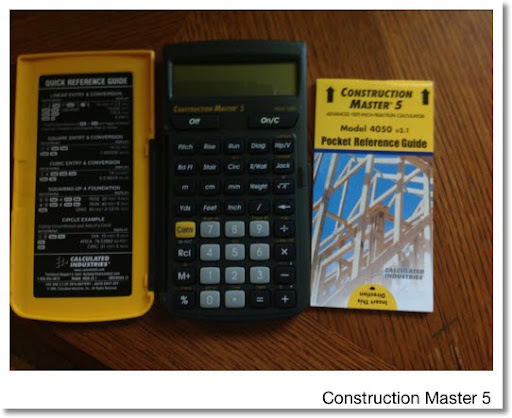 Like the Material Estimator, the Construction Master has an electric tape and the manual is stored in the calculator's case. What is common for all the construction calculators and the Machinist Calc is that we can make calculations using yards-feet-inch, meters-centimeters-millimeters calculations and conversions. This is a super feature. I really could use some more time learning the features of these calculators. So there is my collection. We can go the other way, from a system of linear differential equations to a single multi-order differential equation. This concludes this blog post of Differential Equations. In a week I will be headed to Fort Collins. CO for the HHC 2013 conference. I am so excited - may the bad weather go away and everyone be safe! In this blog we will explore one of the ways to solve the differential equation y' = f(x,y) by numerical methods. One of the common methods is the Runge-Kutta 4th Order Method, probably the most common methods. (Almost) obviously use either a calculator or mathematical software for this process. We want y1 when x1 = 1 and y2 when x2 = 2. Observe that h = 1 with x0 = 0 and y0 = 24. Note the lack of x term in f(x,y). Note h = 0.1 with x0 = 0, y0 = 2, and f(x,y) = -x + y.
where x and y are functions of a independent variable, say t for example. Well treat t as a time variable. It is relatively easy to find the critical points of a system. Add that needs to be done is to set x' = 0 and y' = 0. The next step is to solve for x and y. The roots are crucial and determine the behavior of the critical point. * λ1 and λ2 are real and positive: critical point is a source. Let's work with some examples. Our critical point is (0,0). The Jacobian matrix is J = [ [1, 4] [2, 3] ]. Real and opposite signs, the critical point (0,0) is a saddle point. Solving the system yields the critical point (-2, 4). The eigenvalues of J are 3 and -5. Since the eigenvalues are real and are of opposite signs, the critical point (-2, 4) is a saddle point. which implies that we have two critical points, one with y = 0 and the other with y = -3/4. If y = 0, then x = 2*0^2 = 0. One critical point is (0,0). If y = -3/4, then x = 2*(-3/4)^2 = 9/8. The other critical point is (9/8, -3/4). And the eigenvalues of J are -1 and 3. The critical point (0,0) is a saddle point. And the eigenvalues are (5 ± √13)/2. Approximate values are 4.302776 and 0.697224. The critical point (9/8, -3/4) is a source. Hope this helps and we'll talk next time. Please feel free to post questions and comments. The logical operator XOR and addition may be very similar, but they are not the same. Likewise, the logical operator AND and multiplication may be very similar, but they are not the same. Hopefully this clears any confusion up between arithmetic and two logic gates sometimes labeled as arithmetic. As always, love any comments and thanks as always. where A, B, C, x, y, and z are integers. As a result A^x, B^y, and C^z are integers. Let A^x be even (where A is a multiple of 2). Let B = p*m where p is a prime number. Then B^y = p^y * m^y. The only even prime is 2. All other prime numbers (3, 5, 7, etc. ) are odd. p = 2 and m is even: p^y is even, m^y is even, B^y is even, and C^z is even. p = 2 and m is odd: p^y is even, m^y is odd, B^y is even, and C^z is even. p ≠ 2 and m is even: p^y is odd, m^y is even, B^y is even, and C^z is even. p = 2 and m is even: p^y is even, m^y is even, B^y is even, and C^z is odd. p = 2 and m is odd: p^y is even, m^y is odd, B^y is even, and C^z is odd. p ≠ 2 and m is even: p^y is odd, m^y is even, B^y is even, and C^z is odd. p ≠ 2 and m is odd: p^y is odd, m^y is odd, B^y is odd, and C^z is even. Sometimes using algebra can be more efficient than using Laplace transforms in solving systems of differential equations. 2. Solve for y' and equate it to g(x). 2. Solve for x' and equate it to f(y). Let's take some examples and see how this works. In all examples presented, x and y are functions of t.
We have a homogenous second order differential equation. The practical approach to this type of problem is to end up working with a homogenous second order differential equation, if possible. λ^2 - 2 = 0 and λ = ±√2 (-√2 and √2). If we run into a non-homogenous second order differential equation, its not the end other world, refer to Part 8 ( http://edspi31415.blogspot.com/2013/09/differential-equations-8-second-order.html) on how to deal with such equations. The next example I purposely set it up so we are going to use variation of parameters. We only have to do the variation of parameters once. The solution to (II) has the form y(x) = y_h + y_p. y_h is determined by solving the equation as if f(x)=0. In other words, forget f(x) for the moment. Use the techniques similar to Part 4 and solve the characteristic equation λ^2 + A*λ + B = 0. The nature of λ1 and λ2 determines the nature of solution. (0) Start with y" + A * y' + B * y = 0.
u, y1, v, and y2 are all functions of x. The functions y1 and y2 correspond to terms of the solution to the equation y" + A*y' + B*y = 0. (5) y_p" = u' * y1' + u" * y1' + v" * y2' + v' * y2"
(6) u * (y1" + A*y1' + B*y1) + v * (y2" + A*y2' + B*y2) + u' * y1' + v' * y2' = f(x). (7) u' * y1' + v' * y2' = f(x). W is called the Wronskian. First figure W (the Wronskian). That wraps up this edition of Differential Equations. Next time, we are going back to systems of equations. Thanks as always. Happy Labor Day!